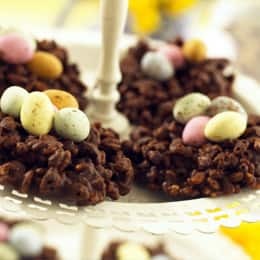 Shredded Wheat or Rice Krispies and melted chocolate make perfect nests for candy coated Easter Eggs and they are quick and easy to make. Crush the Shredded Wheat into a bowl with your fingers. Put the chocolate chips into a saucepan together with the butter and golden syrup and melt over a gentle heat. Line two cookie sheets with parchment paper or aluminum foil. Stir the Shredded Wheat into the chocolate mixture and spoon eight mounds onto the lined cookie sheets, shaping into rounds with a dip in the center.